One of the last larger projects to wrap up, the boom. 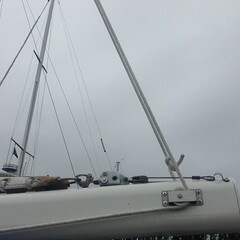 It was in poor shape, the goose neck fitting was seized up and tilted to port about 10 degrees permanently hindering the sail shape and twist. The reefing system was anything but efficient. The boom was missing the appropriate hardware for reefing, too many holes drilled and left unplugged, useless hardware that hung from the bottom, and corroded. First thing was removing all the hardware, no problem, some corroded screws to drill and tap. The end caps were corroded so badly that we soaked the screws with a can of screw loose lubricant and let it sit overnight. Still most of the screws had to be drilled and tapped on those too. Once the end cap with the goose neck fitting was out John tried to remove the pin. Nope. The pin on the goose neck fitting wasn’t going to be coaxed out with lubricant and no amount of DEAFENING POUNDING budged it. An hour of pounding on the pin with a rubber mallet, echoing in the storage unit was more than we could take, even with the ear protection. We heard someone yelling to knock off … Blah blah blah or something to that effect, sorry we weren’t able to hear you! John finally gave up with a sore shoulder from pounding. We took it to the yard where he borrowed a hydraulic press and used a bolt as a pressure point to press out the pin, but the bolt was too wimpy and the bolt head flattened and broke. Found a larger stronger bolt and increased the amount of hydraulic pressure. 20,000 pounds of pressure pushing down, the pin popped out with a large bang. Day saved, the pin and goose neck were in good shape, just needed to be cleaned and lubricate. The goose neck now rotates properly! The reefing system was cumbersome for John and damned ugly if I did it. 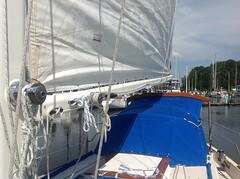 A lot of muscling the main sail down and yanking on the jammed lines was the routine. The cheek blocks and pad eyes were 2 sizes too small for the lines and would get stuck and chafed. It wasn’t a priority job since we rarely reef while sailing on the Columbia river but out on the ocean John didn’t have a choice about reefing, somebody had to do it, so it became his job while I watched the sail flail and boom bounce around, safely in the cockpit taking orders for raising and lowering the sail as required. I never claimed to be manly. We now have dual sided reefing with Lewmar #6 winches, reef hooks secured at the mast, rope clutches, cheek blocks and cleats all sized for 7/16 inch line. 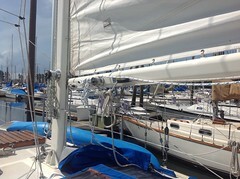 The topping lift line runs all the way to the mast, and the new hardware won’t be chewing up the main sail while flaked. Beautifully painted with 2 part epoxy paint, it’s all ready to go and I’m very excited to practice reefing! In addition to sparse hardware, the boom was really high, probably standard height for WS but too high for me to attach the main halyard to the headboard or even flake it adequately (for non-boaters this means folding it neatly with pleats on top of the boom for stowing). 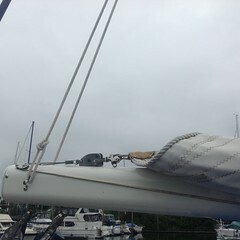 John drilled new holes in the mast and dropped the tack attachment plate 6 inches. Took very little time as our boom fitting attachment plate is very simple and not welded, just screwed on. It’s still plenty high enough to clear the boom gallows and I’m able to attach the halyard, flake the main sail, and cover it. 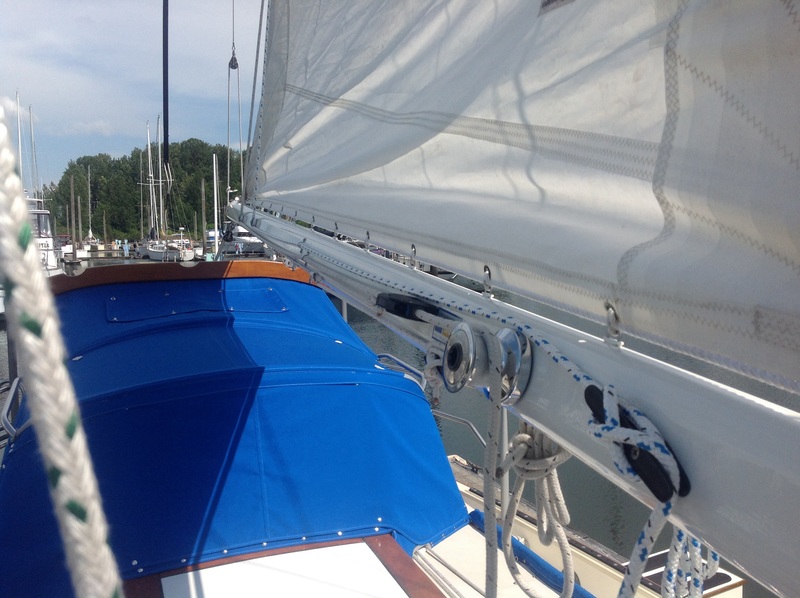 Lowering the entire main sail also reduces the weather helm, 6 inches doesn’t seem like much but it does make a difference in handling the boat when the sail is loaded. Thanks Gary Burton and Dave King for your tips, you guys know it! We had an issue with our water system, again. For the last nine months we’ve been having issues with the water system leaking air and it has been moldy tasting. It just happened all at once, how could that be. The convenient water faucet on the dock made it easy to just live with the problem until the very last minute, when we’re running out of time! 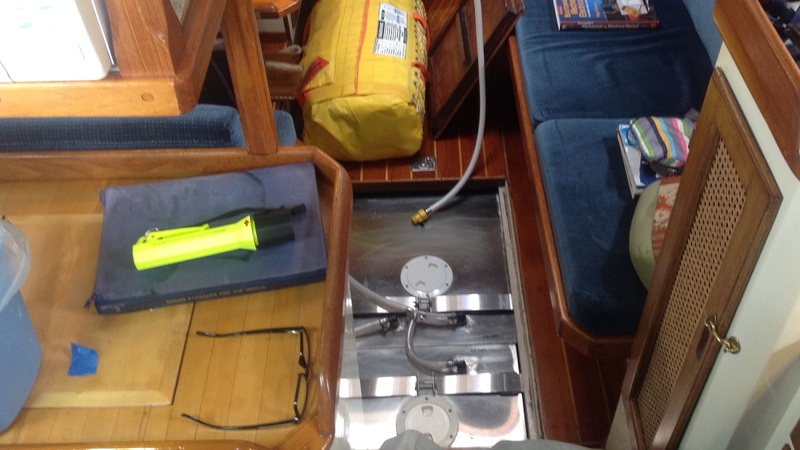 Last fall we pulled both stainless steel tanks, cleaned out the bilge and laid in new tank supports. All the filters and strainers were removed and cleaned, scrubbed out the tanks, replaced all the water hoses and fittings. And replaced the heavy, space eating 3 gallon steel pressure tank with a new petite Shurflo water accumulator. 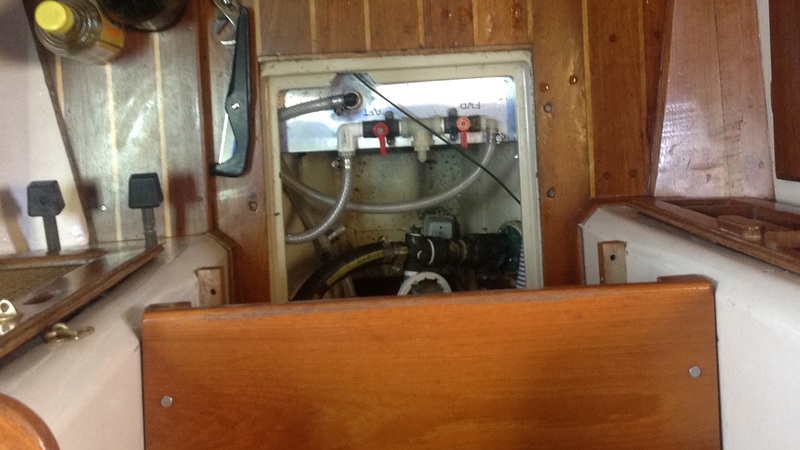 I rebuilt the galley’s manual foot pumps, and the manual pump and hoses in the head are new, John installed those a few weeks ago so those weren’t variables in the leak but rechecked anyway. We finally got down to business of fixing it this last week when we kept having to turn off the breaker at the electric panel to keep the pump from burning itself out. 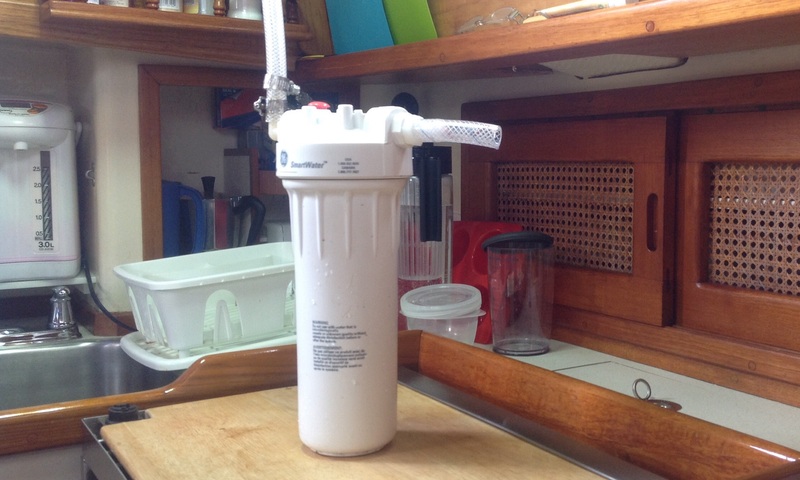 The culprit: the newer water filter system. John had suspected it earlier but thought maybe it was okay because the water pump and pressure worked just fine after checking and cleaning umpteen times. Although the moldy tasting water didn’t disappear. Either the O-ring or the air bleed valve on the top was defective, of course gradually allowing air in perpetuating the mold growth. There was a slimy film around the end of the filter that smelled moldy. We decided to go simple and removed the spitting filter, one less piece of junk and carrying filters. We have the larger dockside filter system for places that have questionable water quality and sediment, and we’ll be treating our water for bacteria anyway, so actually double filtering the water is for taste quality only. Supposedly Portland’s water quality and taste have a very high rating but I don’t like the taste of even mildly chlorinated city water so I’ll just add a shot from my favorite ‘filter’ stashed under the settee. Looks like John has already been filtering his water or maybe just happy he can move onto the completion of our boom and reefing project. SOLAR PANELS – At last! Short-shipped parts, family matters, and work slowed the project down by a month but we are happy with the panels and setup. 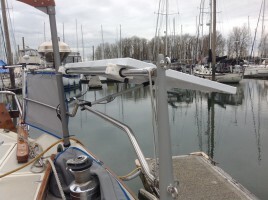 John made aluminum frames and bought aluminum extension poles from Sailrite that allows the panels to flip up beyond 45 degrees and stow flat against the rails. Total framing and pole cost was about $35 per side panel. The weight of one frame and panel is about 6 pounds. The third moving panel doesn’t have a frame as it can be fastened down to the top of the dodger or anywhere and stowed when not needed. It will have long enough connector leads allowing it to follow the sun from anywhere forward of the dodger too. The sun came out a couple of days and confirmed the panels were producing enough power to run the power consuming monsters – 4 amp diesel heater and 5 amp refrigerator, the pressure water system, the low amp cabin lights and fans for two consecutive days with no concerns of low voltage. We have 300 watts but what really counts are the amps available and usage. The forecast is for sunny weather the next two days, it will be interesting to watch the volt meter as we run the radios and radar in conjunction with the other electrical requirements. STAYSAIL REEF POINTS – We didn’t bother asking Kern for the reef points on our new staysail, we already knew that he doesn’t exactly agree reef points are all that efficient. The local sail maker did a nice job of getting the tack and clew aligned properly for the sail angle. 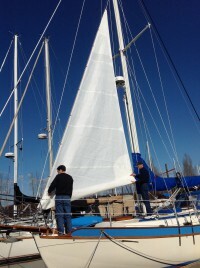 A necessary sail reduction made easy in boisterous, gusty winds. 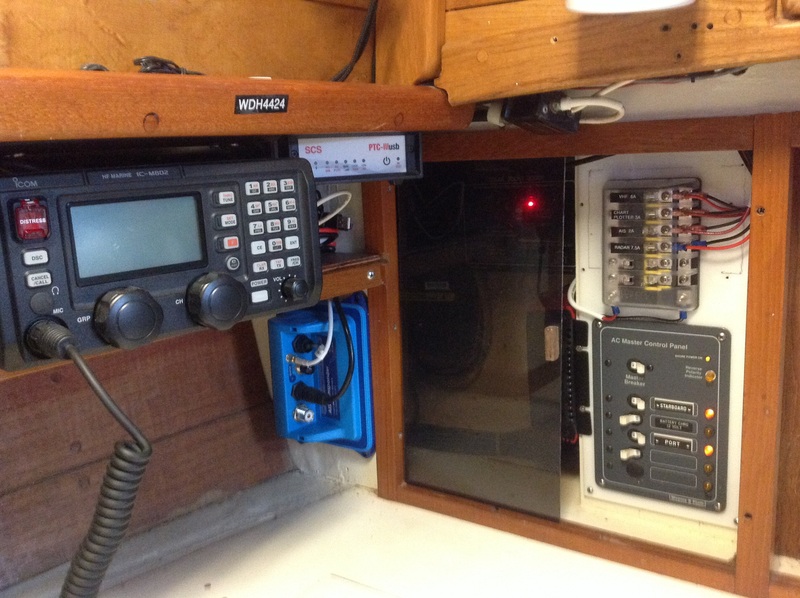 SSB RADIO INSTALLATION- For non-boater friends and family, this means Single Side Band, technical details to layman terms – a high frequency radio that enables communication from the middle of the ocean without ginormous land antennas. John did a nice job of wiring and attaching the other necessary components. We will be able to radio other boaters and harbors, download weather data to the laptop, send and receive emails while we travel across the ocean. While it wasn’t terribly difficult, (at least I don’t believe so as I didn’t hear any bad words) it was time and labor intensive to complete the installation. 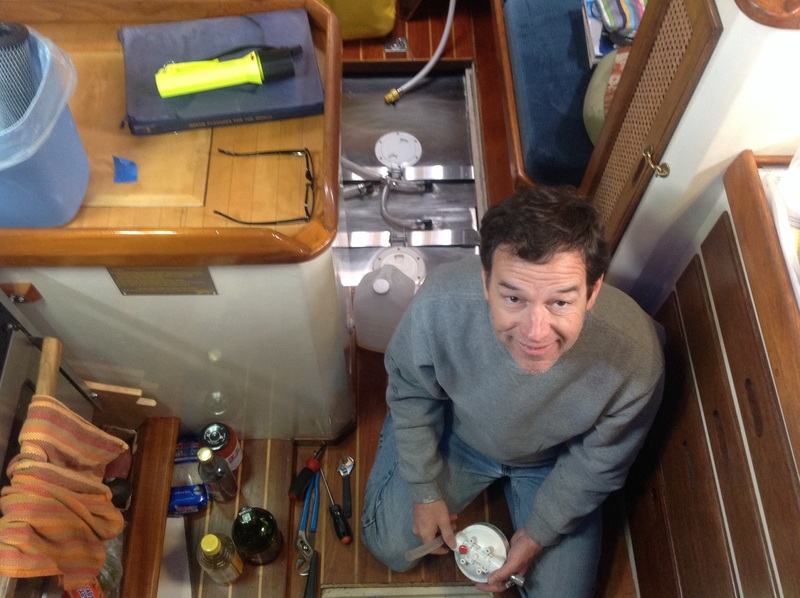 Crawling around the engine room and up under the navigation cabinetry in contorted body positions provided John the opportunity to exercise some rarely used muscles. OTHER CHECKS – Numerous small projects are being accomplished throughout the boat, it’s an ongoing list to make the boat cruise ready. Kinda like living in a house – tweak this – fix that, organize clostes, clean out the garage, paint the entryway. How many more NECESSARY projects to be done before we leave? 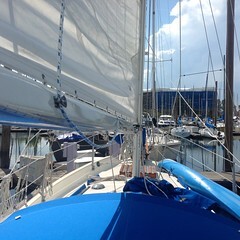 New Dodger in progress, Boom maintenance and Reefing system., and a couple of long weekends. More pictures will be posted in the header pages later. CHEESECAKE, not a Pie to fulfill the Project and Pie list, but as long as my John is happy, I’M HAPPY!